THE Cathedral hall along Nelson Mandela Avenue, venue for mixed acapella group Thee Family’s third album launch imposingly stood beside the nation’s August house. Harare’s dazzling evening lights directly shone on the brick and mortar structure, adding a uniquely glitzy colour to a spot which ecstatically embraced acapella lovers from all walks of life. If the venue’s outside appearance was a marvel, then the inside was unrivalled. It was immaculately dressed in classy apparel in the form of pricey décor material which proved beyond any shadow of doubt that the youthful ensemble took time to thoroughly prepare for this important day on their calendar. The multitude of gospel music lovers who thronged the venue to witness Simswabisile usatane’s (we have embarrassed the devil) official album launch added colour to a vibrant program and were deservedly treated to some spiritually uplifting musical arrangements from guest groups, The Well, and renowned outfit Reunion, whose songs have a knack of speaking to the inner person where the spoken word fails to deliver. It would be a serious journalistic crime if the musical wizardry of soloist Francisca Bako is denied special mention. No known superlatives are adequate to aptly describe her rendition of the national anthem which kick-started the program. Even arguably the greatest football commentator of our generation, Peter Drury, famed for his poetic commentary, would have run out of words to describe Bako’s scintillating performance which momentarily made everyone forget that they are bearing the brunt of a comatose economy and felt proud to be Zimbabwean. 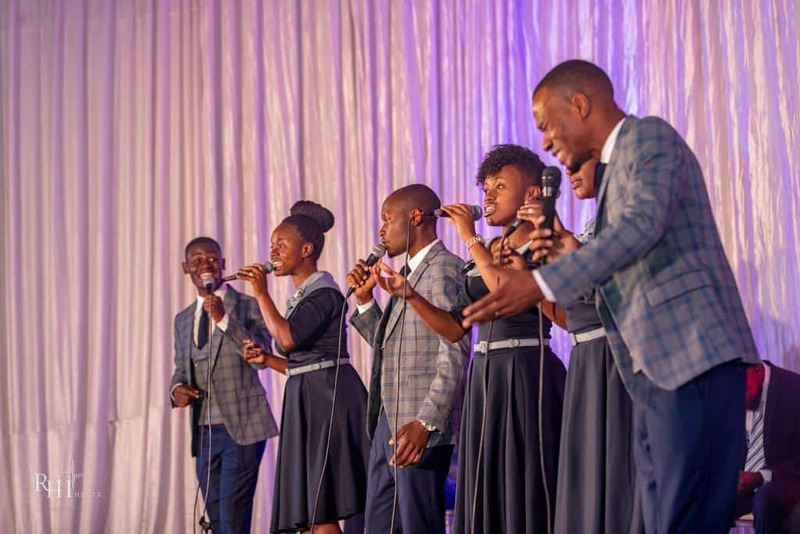 When Thee Family finally took to the stage, they firstly wowed the audience with yesteryear hits from their previous two albums “Shall we gather” and “Inorema nzira” before sampling tracks from the current album. The energy radiated on stage, the visible passion on their faces and their lyrical prowess coupled with a unique distinctive sound all combined to make their performance electric and nourishing to the soul. Their ability to connect with the audience and make them not only feel but actually touch the words in their songs is consummate. The program’s master of ceremony Mangaliso Sibanda was left awe struck by the group’s performance. Acapella follower, Benedict Marufu, who attended the album launch was full of praise for Thee Family. “The program was well thought out, it shows that they devoted their time and resources towards this program. I however feel that they underestimated the number of people who will attend because others ended up failing to find chairs as the venue was packed. Maybe their next launch should be at 7Arts,” joked Marufu. One could not help but marvel at how they have matured musically since their inception in 2009. “Our journey has not been easy. It has been marred by countless challenges but the Lord has been good to us,” said the group’s founding musical director Eddie Matsika. “By allowing God to use us in his ministry, we have grown spiritually and our music has improved as well. We will be touring Zambia in November where we will feature at Asante Acapella’s album launch. It is our humble prayer that the Lord continues to use us in his vineyard, empowering us to touch lives and give hope to those on the verge of giving up,” added Matsika. The group’s founding director, Hlanganani Ngwenya concurred with Matsika adding that the turnout at the album launch was overwhelming. “The attendance spoke volumes of the support and confidence people have in us which is humbling. We are always grateful for the support and love because without it, we would have given up a long time ago,” said Ngwenya. To confirm support for Thee Family, Michael Nyirenda was the toast of the evening as he bought the album’s first copy for $125. For the benevolent gesture, he received a bottle of non-alcoholic wine from Signitive Enterprises, the launch’s official sponsor.